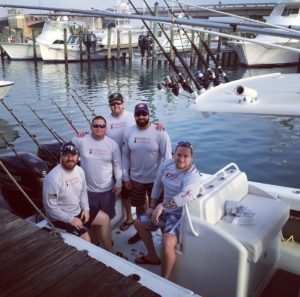 Last year Freedom Alliance launched a fishing charter, tailor-made for Marine Corps veterans, which embarked several times to the Bahamas and Florida Keys. This was thanks to Nick Kefalides, a newly retired Marine, who has been at the helm of this particular endeavor. Nick once attended a Freedom Alliance event, caught the spirit of our mission, and wanted to help. 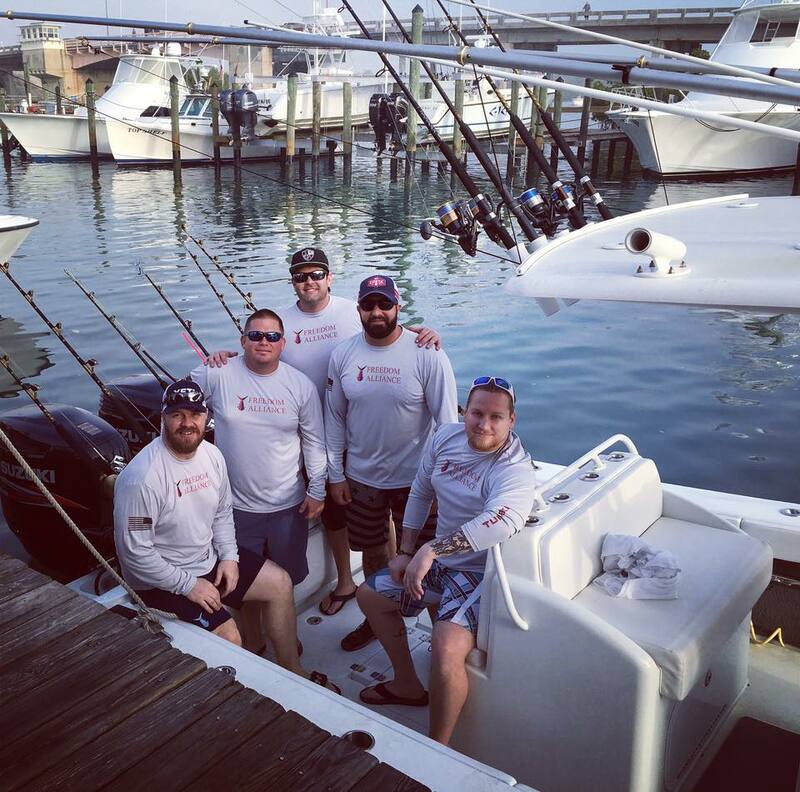 He offered to organize and host these fishing charters, and the result has been three unforgettable adventures for service members recovering from combat trauma and injuries. A couple weeks ago, Nick set out for the fourth time to warmer waters, with two Marines from Wisconsin, happy to head to the sunny South. Tim, a 20-year veteran of the Marine Corps, was a first sergeant who conducted multiple humanitarian missions and was injured in Iraq, resulting in two Purple Hearts. Scott was the sole survivor of a vehicle bombing in Iraq. While removing fragments of metal from his head, doctors found a brain tumor that would have killed him had it gone untreated. These two definitely deserved some fun time, and Nick had an incredible vacation planned for them. “This Bahamas trip was by far the most successful yet,” he said. This was due in part to the great cast of characters involved. Nick’s friend Brian, from Jupiter, Florida, who has practically spent his whole life on the water, volunteered himself and his boats for the three days of fishing. When Brian heard Nick talking about his work with Freedom Alliance, he immediately wanted to participate. As an expert fisherman and mariner, he had a lot to offer, and Nick took him up on it. 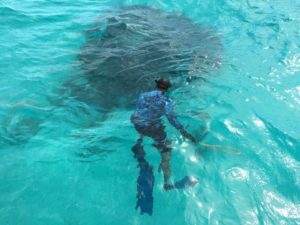 On March 17 Brian welcomed the Marines aboard his boat in Florida, and the men journeyed two hours, over a “flat as glass” channel, to reach the Blue Marlin Cove Marina on Grand Bahama Island. 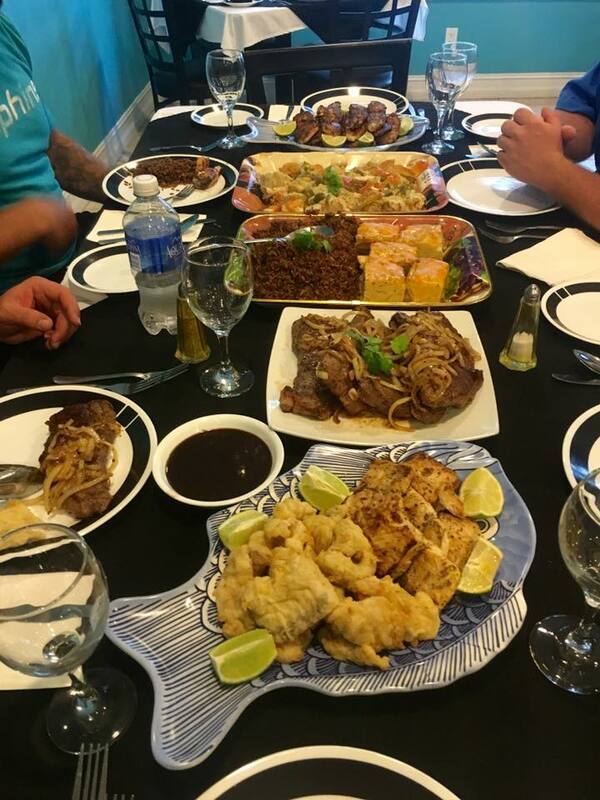 Over the next few days, they slept in a spacious four-bedroom condominium, ate plates of seafood, and made lively new friends. But most of their time was spent in the boat for offshore fishing. 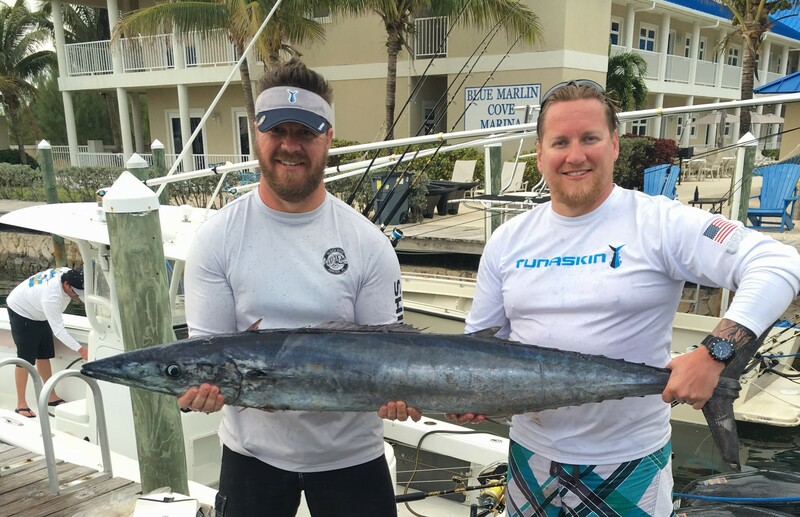 When all was said and done, the crew had caught a fair share of kingfish and wahoo, one of which was 50 pounds. They even slipped into the water with snorkel gear and spears to snag some hogfish snapper. Back at the marina on the third evening, the catch was cleaned and filleted, and the restaurant chef prepared and served the fish for a fantastic meal. 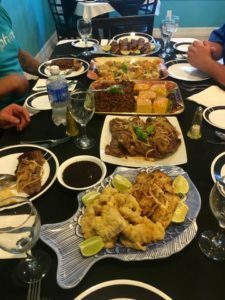 Sharing the dinner and their stories with other boat owners and fishermen led to interest in contributing to future Freedom Alliance fishing ventures. “It was a great weekend getaway with some Brothers,” wrote Scott. He and Tim, two determined survivors, lived every moment to its fullest, drinking deeply of each interaction and new experience. Many thanks to Nick and his friend Brian for so generously representing Freedom Alliance and carrying our message of gratitude to the heroes who fought and sacrificed for us. Stay tuned for our next deep-sea fishing adventure!